One of our most sought-after models, the Luton van has been at the forefront of product development over the past decade, and these developments have enabled users to benefit from an increased threshold for payload limits. This has not only allowed them to carry more in one load, but also provided them with a better return on investment, savings on fuel through better driving efficiency, and reduced the impact on the environment. Justin Gallen, Managing Director at Ingimex, explained: “Over the last ten years we’ve made substantial efforts to further improve the way that we manufacture the Luton van, and this has seen us bring in some leading-edge equipment and machinery to allow us to produce, and ultimately refine, even more here in the UK. Previously, small parts including the shutters, the panels, and the roof were imported from specialist manufacturers in Europe, but by bringing them all in-house we’re able to more closely monitor quality and the finished product. We’re investing evermore in intelligent design and refined material selection to continue reducing the weight of our bodies, with the ultimate goal of 400kg – a drop of 33% from 650kg and a huge 59% from the original 850kg – all without passing any of the costs onto our customers. “While the Luton van has been the focus of our weight saving initially, we have been making changes to many of our vehicle bodies,” Justin added. 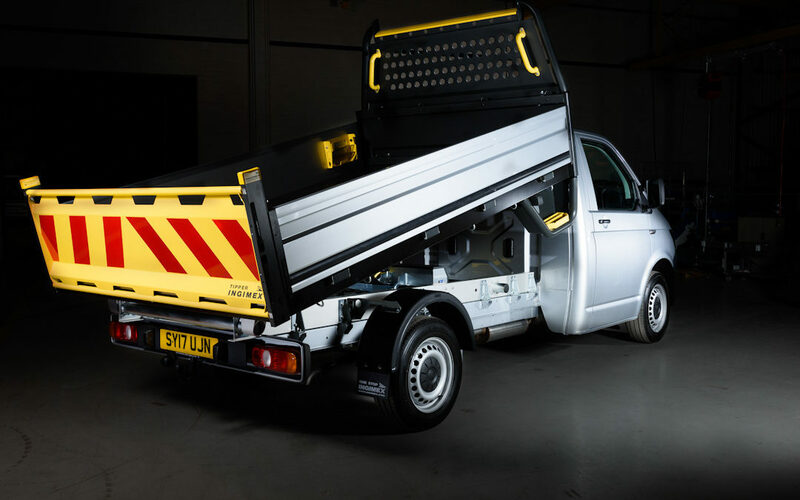 “Our original Tipper which we manufactured for Ford back in 2003 was made from a kit imported from Europe, something that we still see many other providers using to this day. “But in 2017, our Tipper is 250kg lighter than these original kits as a result of the same principles we applied when developing the Luton van – bringing the manufacture in-house, replacing plastic with aluminium where we can, and using and placing material more intelligently. It’s now one of the lightest available on the market, offering up to 1.4tonne payload on a 3.5tonne GWV chassis. “With a lightweight body on a lightweight chassis, the Tipper offers 1tonne payload on a 3.2tonne GWV chassis. We were also delighted to officially unveil our new Tip-Up and Pick-Up range at the CV Show earlier this year, which offer payloads of 1tonne and 1.2tonnes respectively on the VW Transporter chassis, and can now be made to order. “Our Tool Hire spec of the Dropside body was developed in conjunction with Northgate to meet some specific customer demands, and built with the same objective of being 200-300kg lighter than their original Dropside, which was previously manufactured externally. “It’s certainly exciting times at Ingimex, for the wider vehicle manufacturing industry, and for the British manufacturing sector as a whole which has been building on its strengths following a few challenging years. We’ll be unveiling even more developments in the months to come, and we’re looking forward to working with our customers to continue enhancing our offering to meet their ever-changing demands.” Justin concluded. For more information, do contact us.